Formatting phone number has never been an issue, the only thing that you need to do is, use few string functions and you can convert it into any format. But what encourages me to write this article is that we can format the phone numbers in any format using only one function, i.e. 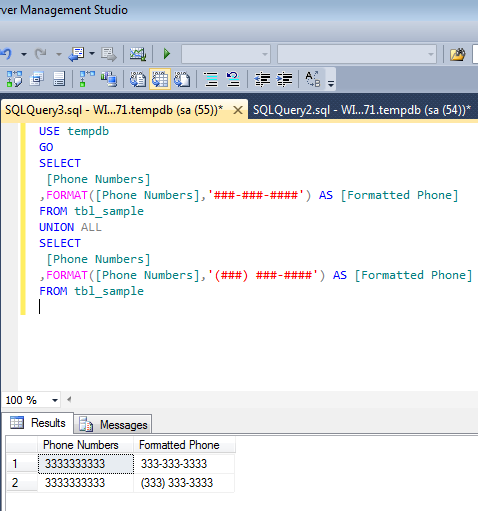 Format (introduced in SQL Server 2012). Note : I usually recommend that phone number must be properly maintained inside the database. But sometimes we come across this issue in legacy systems. Let me create a sample to explain it. In the solution, we will use FORMAT function and provide a custom format of telephone number such that, the Format function will automatically convert it into custom format. Statistics is very helpful when it comes to performance because query optimizer uses these statistics to create query plans to improve query performance. I recently implemented the statistics on memory optimized table and given below are my findings. It uses by default sampled statistics. It has no default statistics, you must specify fullscan option. It supports sampled statistics & fullscan options. It supports ONLY fullscan option. First of all create memory optimized tables and indexes. After that, insert (update, delete) data into the memory optimized tables. 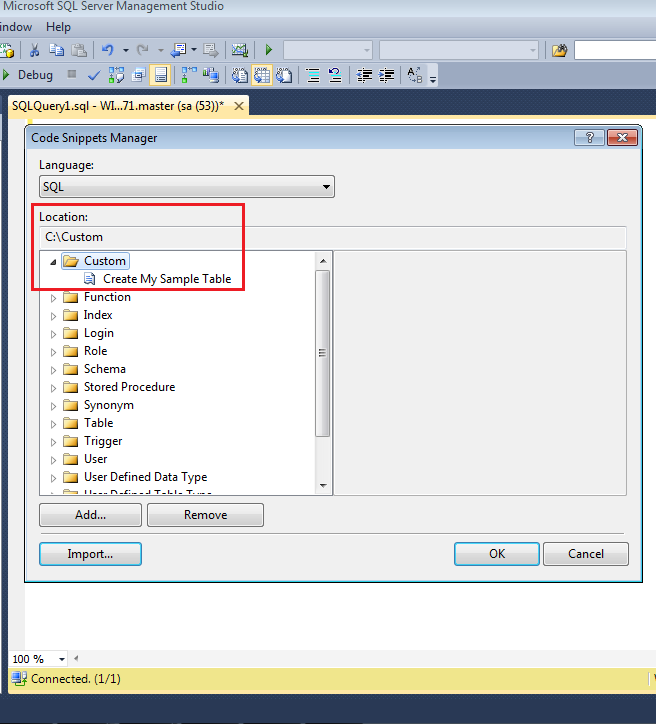 The last step is to create natively compiled stored procedures that access the memory tables. Given below is the script to update memory optimized table statistics. 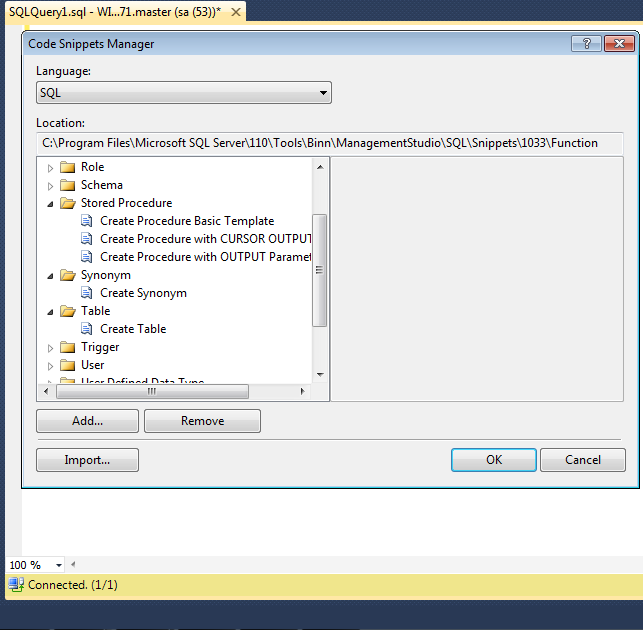 I came across this error message in SQL Server 2012 using Format function, after that I did some research about this error message and came across that this error was part of SQL Server since 2005 or may be earlier than that. But the method to fix this error is same across the versions. Given below are the details & fixes of this error. Error Message: Argument data type %ls is invalid for argument %d of %ls function. In the following example, I have date in varchar format and I am trying to format it into ARABIC culture using Format function. Argument data type varchar is invalid for argument 1 of format function. Ooopps…… I cannot convert the date into Arabic format. Basically, the reason for this error is not Format function exactly. You can come across this error in any built-in function which accepts any argument(s). The resolution to this error is that you need to check the syntax of that particular function and see what type of data type it accepts, in which which argument(s). In our case it is Format function, it accepts three arguments and the first argument must be either Number or date time but we passed as varchar. So we need to change this varchar data type to datetime data type and pass it to Format function. Given below is the correct script. Remember, whenever you come across this error, you must consider the argument(s)’s data types of the function and whatever data types it accepts, you must pass exactly the same data type to that particular function. Let me know if you came across this error and fixed it in a different way. 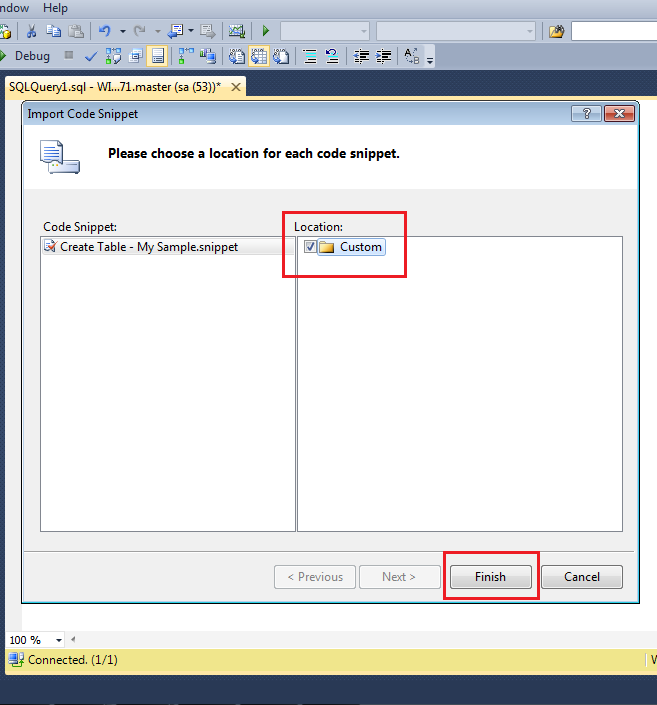 In my earlier articles, I wrote about how to insert buit-in code snippet in SQL Server script. But sometimes due to the requirements, we need to create our own custom snippet. 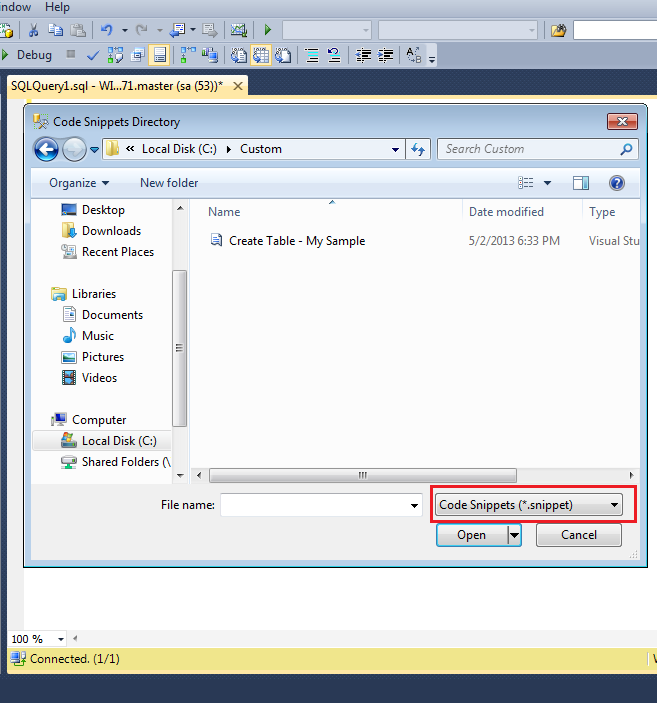 Once you create the custom snippet(s) , you need to register these snippets, because without registration you cannot use in the SQL Server Query editor. There are two ways two register the code snippet. Given below are the details. In this method, you can add folder having code snippet file(s). The advantage of this method is that you do not need to do one by one code snippet files. 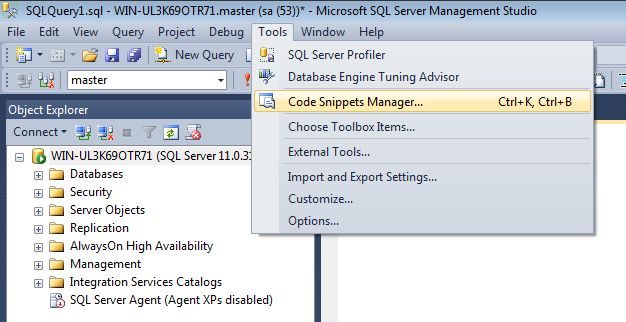 In this step, browse the Tools menu and select the Code Snippet Manager as shown in the picture below. It will open the code snippet manager as shown in the picture below. As you can see above, multiple built-in folders and snippet files for standard objects code snippets are available in the Code Snippet Manager. Now, you need to add custom folder and snippet files in the Code snippet Manager. Click on the Add.. button as shown in the picture below. Once you click on the Add.. button, it will open the files explorer, now you need to select the folders having snippet files.You cannot select an individual file using Add.. button. Just to explain this registration, I created one folder namely Custom and placed few code snippet file in it. Once you select the folder click on Select Folder button as shown in the picture below. Now, you can see that custom folder and snippet files are registered and added in the Code Snippet Manager as shown in the picture below. In this method you can add multiple files into any custom folders. Let me explain this method step by step. This step will be same as method 1. Once you are in the Code Snippet Manager, click on Import button as shown in the picture below. 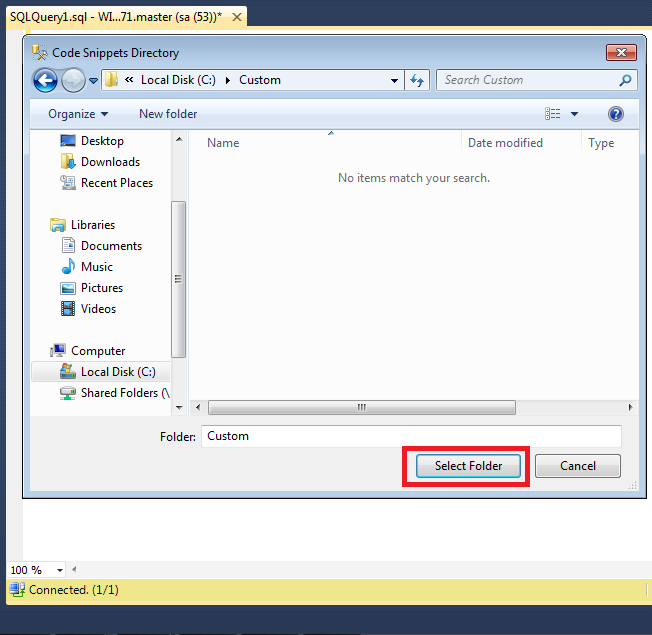 Once you click on Import button, it will open an explorer and allow you to select code snippet file(s). Once you selected the file(s), click on Open button as shown in the picture below. Once you select the code snippet file(s), it will open an another import window and ask in which custom folder you want to add this file(s) as shown in the picture below. Once you select any custom folder for the code snippet file(s), click Finish button. The snippet file(s) will be available in that custom folder as shown in the image below. After publishing a solution how to recover the modified / updated records without backup in one of my previous articles, I received lot of queries inquiring how to find who modified / updated and at what time ? So, I started my research and recently developed the solution. Before proceeding with the solution, let me create a sample to demonstrate the solution. 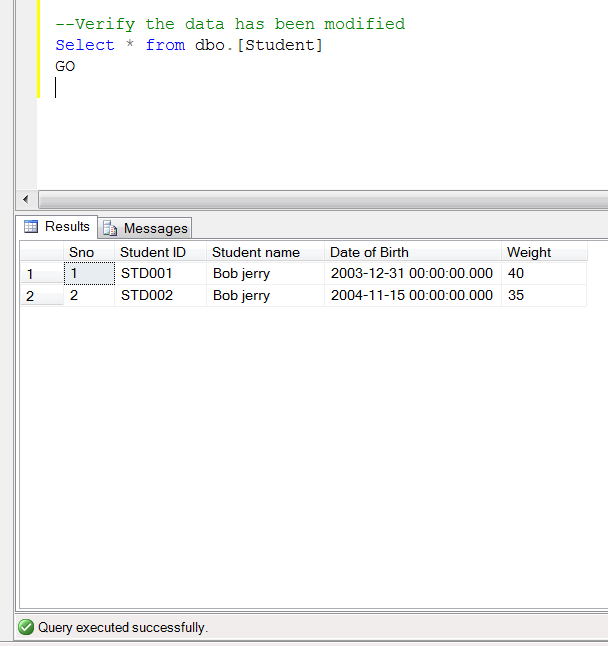 Given below is the stored procedure that you need to execute in the database having modified records. 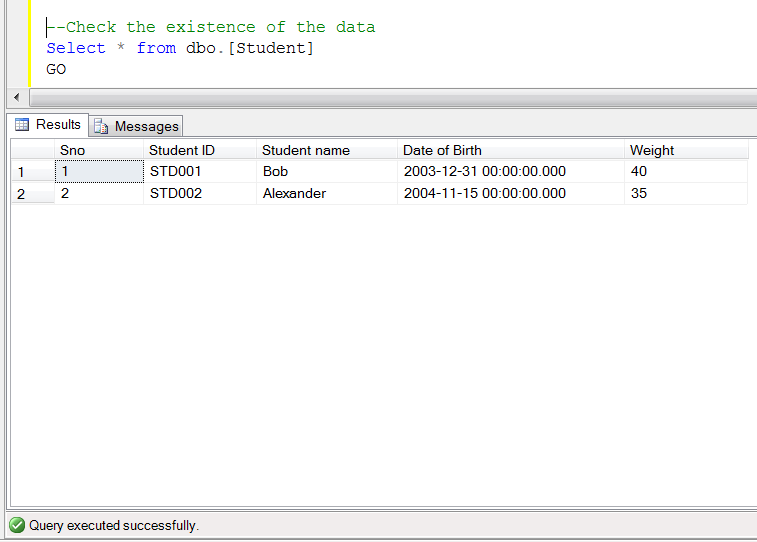 -- Add Page Number and allocUnit ID in data to identity which one page it belongs to. --The modified data is in multiple rows in the page, so we need to convert it into one row as a single hex value. --After that we need to get the old values before modfication, these datas are in chunks. /* If it is @Operation Type is 'LOP_MODIFY_ROW' then it is very simple to recover the modified data. 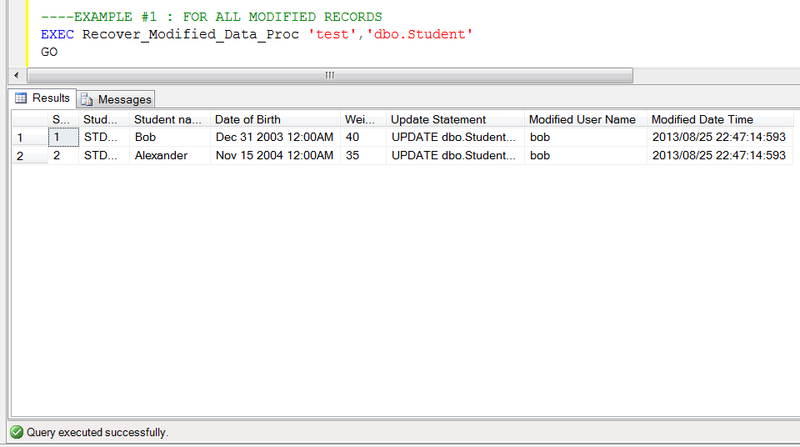 The old data is in [RowLog Contents 0] Field and modified data is in [RowLog Contents 1] Field. Simply replace it with the modified data and get the old data. --- Convert the old data which is in string format to hex format. --It will give you the result of all modified records. Whenever we do data migration from any old systems to new / upgraded systems, we usually receive data in different formats (text files, cvs, excel etc.) 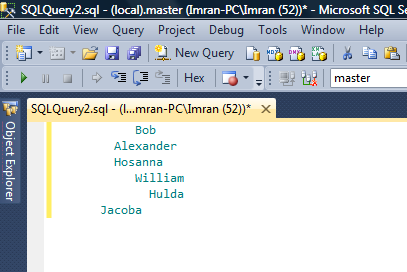 to insert into SQL Server. Sometimes, due to the different formats, the additional white spaces accompany the data. These additional white spaces create problems later in the application. 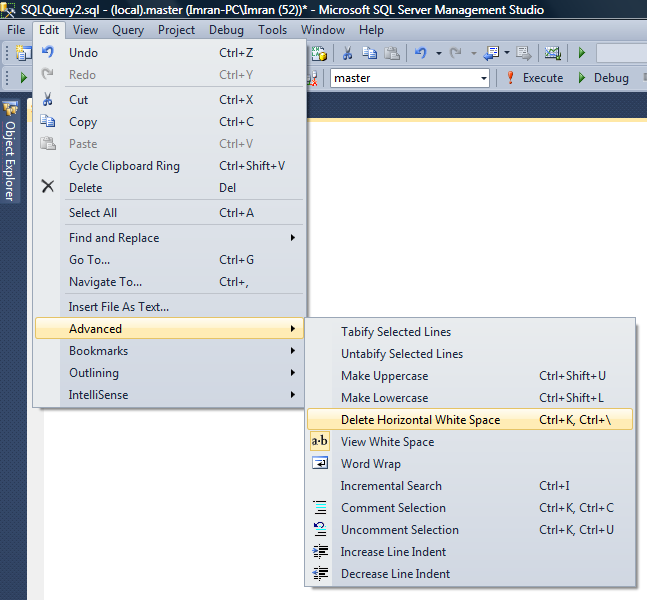 In this article, I will show you how to view the white spaces and a simple solution to remove them from the data, horizontally. Let me explain this, step by step. Copy the data from any format (text files, cvs, excel etc.) 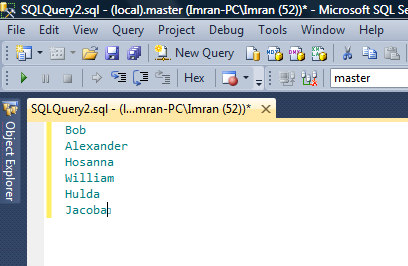 to SQL Server editor (new query window). 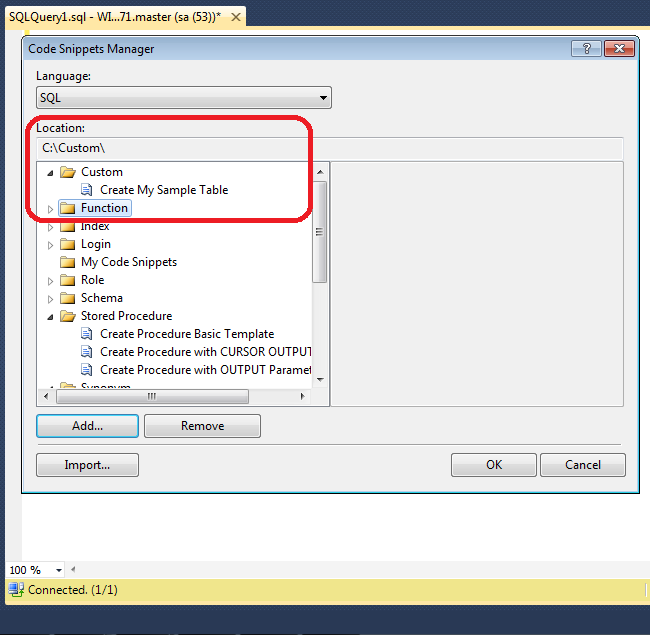 In my case, I will copy the data from text file and paste it into SQL Server editor. 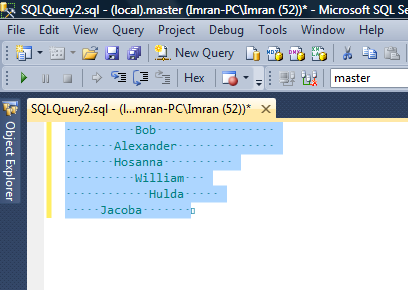 Now, you can see that the data is not in a proper order, obviously because the white spaces have accompanied the data . 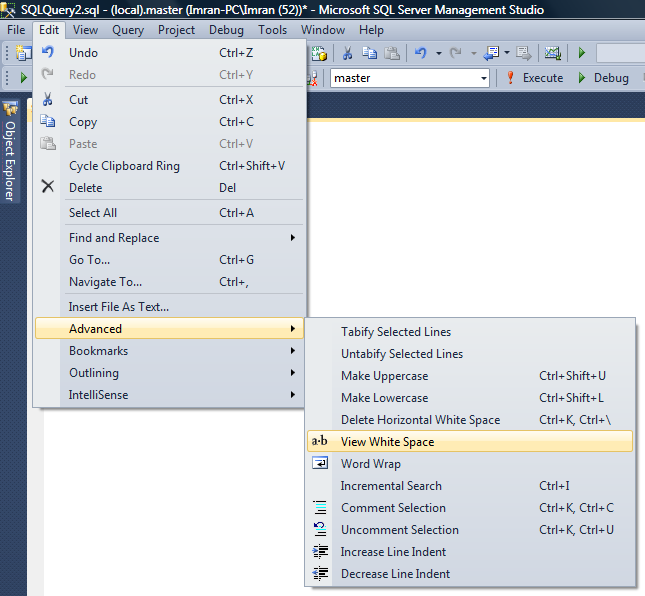 Let’s view the white spaces in the data using SQL Server editor. Click on the Edit menu select Advanced and click on View White Space. As shown in the given below image. Given below is the image showing white spaces. Now, select the data from where you need to remove the white spaces horizontally (Note : If you want to remove white space from one line or from either left side or right side, just select that particular area as shown in the image below). Once you select the data to remove horizontal white space, click on the Edit menu, select Advanced and click on Delete Horizontal White Space, as shown in the picture below. Now, you can see, in less than seconds the white spaces are removed from your data without any effort. Let me know how you usually remove the white spaces horizontally from the data. Whenever you work on legacy data, you usually expect some sort of data in incorrect data types, but of course with the compatibility. 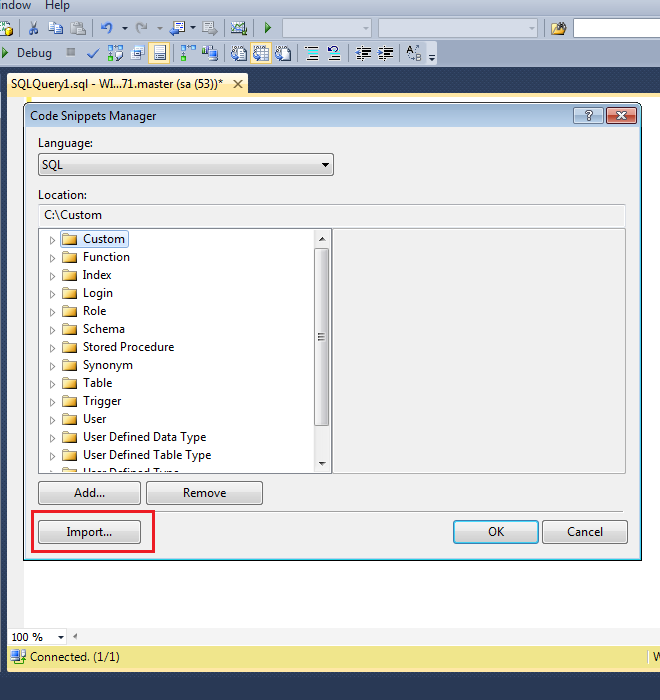 Recently, I migrated one of my client’s data from legacy system to SQL Server 2012 and I came across an issue where the client had a date in varchar field and the data had been placed in dd/mm/yyyy format in that field. The data type had to be changed from varchar to datetime. Lets try to convert it from dd/mm/yyyy (varchar) to datetime. Ooopsss, you cannot convert it directly. I continued with my research. Finally resolved it. Given below is the solution. 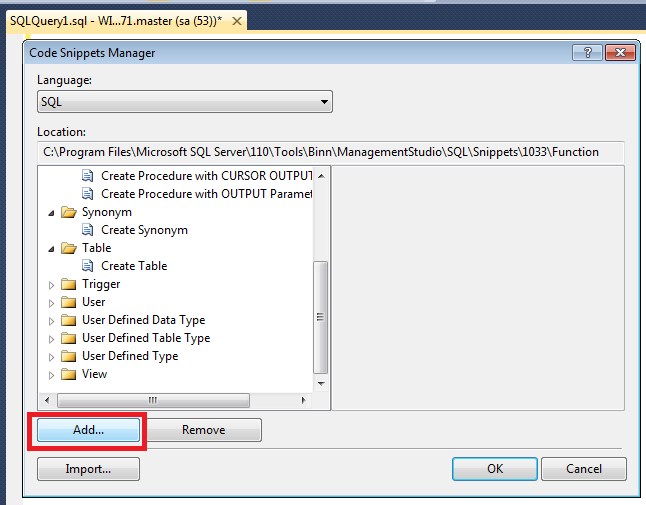 In this solution, we will use TRY_PARSE function introduced in SQL Server 2012. Given below is the script. Let me know if you came across this issue and resolved it in a better way. 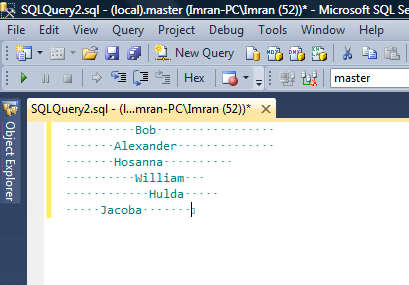 Note : For the earlier versions of SQL Servers, you can convert it like this.